Now that Halloween is less than two weeks away, I wanted to bring you two polishes from the Hocus Pocus Collection by 365 Days of Color! BUT I had to wait until they were re-stocked so you could enjoy them too! The Hocus Pocus Collection is named after the famed Disney movie, starring Bette Midler, a pre-SATC Sarah Jessica Parker, and Kathy Naijimi. 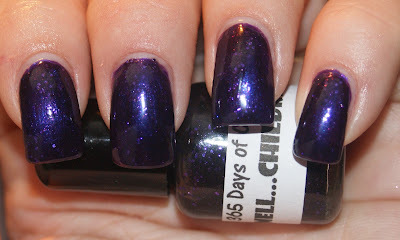 First up is I Smell... Children, a purple jelly polish with blackened purple shimmer base jam packed with fine purple glitter. This is with just one coat over NYC Midnight Amethyst. I LOVED how much more depth this gave me polish. You can wear it on its own (with three or four coats for opacity) or layer it over another color. The application was like butter! And this is I Put a Spell on You, a clear base glitter top coat with tons of different sized green and black glitters. You can definitely see some hex glitter in there (get it? Hex?) too. The above is one coat of the top coat over Ulta Jaded, a blackened green shimmer. I LOVE LOVE LOVE LOVE LOVE LOVE this combination to the point where I wore it for a week. A WEEK. I barely make it three days wearing any polish anymore. All of the Hocus Pocus collection by 365 Days of Color is available at the new store page here. Mini bottles (5mL) are available for $4.50 or $20 for the set of five. Full sized bottles (15mL) are $8.50 or $38 for the set of five. So do these get you in the Halloween spirit? Are you in love with them as much as I am? These are awesome!!! They look good on you! Great swatches! !